I thought this was poorly done – until I remembered that it was a YA novel, and I lowered my expectations of literary subtlety. Then I really got into it. It was thrilling and action-packed and peppered with romance and magic. The setting of Anglia, an alternate Jacobean Britain where King Malcolm rules a land of oppressed witches looking for revenge was beautifully conjured by Boecker’s writing. I had no trouble believing that this was an actual period in history. 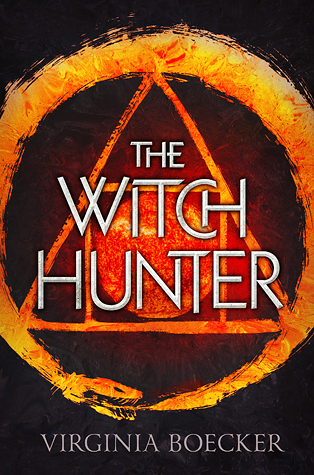 Petite, blonde and deadly, sixteen year old Elizabeth Grey dispatches witches on the orders of ruthless Lord Blackwell, never questioning her orders until she herself is accused of witchcraft. Elizabeth soon finds herself on the wrong side of the law and her own beliefs. The resolution that we had been hurtling towards for the entire novel fell a little flat. Perhaps a little more space should have been given towards it and the villain should have been less expository in his final paragraphs. The use of magic felt instantly believable, which can be difficult for some authors to pull off. I feel a sequel must be in the works, because some of the characters seemed introduced for no other reason than that they could be. George seemed a little irrelevant, as did Schuyler, but both were likeable enough. Fifer played the obligatory mean girl but her motivations seemed extremely sound. John and Caleb were good love interests, even if Elizabeth’s “love” for John seemed a little fast and baseless. I was a little concerned, not by the level of violence, but the main character’s Elizabeth willingness to engage with it. She had been raised as a Witch Hunter from a young age and put through a gruelling and harrowing training regime designed to harden her, but I felt she could have been a little more likeable if she was more remorseful. On the other hand, if the author was not going down the route of a heroine tormented by her actions, then perhaps the violence could have been a little more realistic. One thing that I thought was carelessly unresolved was an event that led to Elizabeth’s arrest for witchcraft. She enters into a sexual relationship of dubious consent with an important side-character and her attempts to obtain contraception lead to accusations of witchcraft. It does not receive much thought from Elizabeth herself, despite her personal feelings an unmarried sixteen year old, her professional feelings as a Witch Hunter, the political ramifications of her actions or the later revelations that she was casually “pimped out” to further an assassination attempt. Even a quick conversation with her love interest or another female character might have resolved this for me. In addition to this, it is not given much mention that Elizabeth is both a teenager and a female Witch Hunter in 16th century England. However, I can see that the author wanted to avoid creating an overtly female-oppressive environment and leave it more suggestive. Perhaps avoiding these issues helped to create that? I would definitely recommend this novel to both YA and adult readers who are after a magical fantasy featuring a strong female character, a believable setting and plenty of action and intrigue.